The bare trees in the distance belie the sensations of spring on this sunny January afternoon. Winter relented for a few days this past week as we tasted a spell of pre-spring balm. Leaving the office in the afternoon to absorb the sunshine under that massive dome of sky blue hemisphere awakened senses that have been dulled since December by so much of winter’s gray, dreary chill. What monstrous bureaucrat decreed that man should be oppressed by walls and computer screens on days such as this, when practice for spring sport is going on right across the street from the office? Life is too short: I protest. 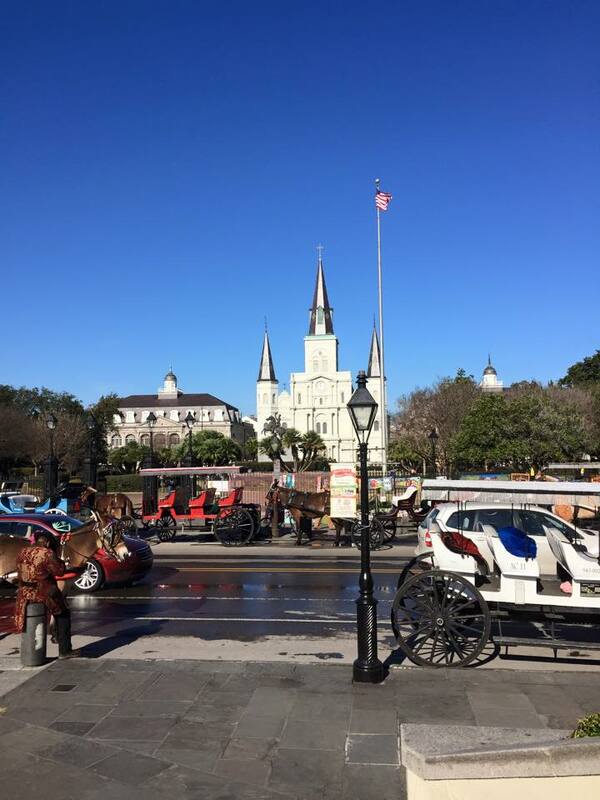 Ground zero for tourists in the French Quarter: Jackson Square and St. Louis Cathedral. compose this post, the lazy jazz strains stirring rich memories of the past weekend with family and friends as we gathered to support our son-in-law’s run of the Rock ‘n Roll Marathon; to reunite with both of our kids and their spouses who all live so far away these days; to hang out with that silly six-year old granddaughter from Texas; and to play with our daughter-in-law’s family who came along to make it a party. A wholesome party of family, friendship, and fellowship in that city so fabled in my family’s memories. For me, the association goes back all the way, as long as I can remember, because of my childhood family’s roots and my growing up in the greater New Orleans area. But the associations have been enriched in adult life as the city became a crown jewel of a place for escapes and get-aways for my wife and kids. Curiously or maybe not so curious, as many times as I’ve gone to walk the same streets and cross the same Mississippi River ferry and eat the same oyster po’boys and view the same sights, I haven’t reached that point where enough is enough. New Orleans is that place where the “same old, same old” will never be. In fact, chances are that I’ll grow same old same old long before this exotic city does, as she exudes her Old World grace and charm, gleaming on the shores of that great River as a crown jewel of metro-Americana. Was last night’s diverse worship service of Christian unity in Eunice, Louisiana, a foretaste of heaven? Maybe not—-Heaven is unimaginable this side of eternity. But compared to best possibilities of good times and feelings here below, last night was hard to beat. Worship and church leaders from multiple churches, from the Monsignor to the preacher, the priest to the elder, and other clerical ranks sat side by side on the rostrum as their congregations melted together in a sanctuary crammed with multi-racial, multi-denominational worshipers. No Catholics, no Methodists, no Baptists, no Assemblys, no non-denominationals: Just a room full of joyous Christians who raised the rafters of the house with spirited praise and compelling proclamation. Casting dogma and division aside is liberating! I’ve been in some exciting worship services in my years going to church. I’m not ready to pronounce this as THE best ever, but I can recall only 2 or 3 other experiences that ranked anywhere close to it. Even on this day-after, the warm afterglow of fellowship and communion from last night persists. If we’ve known such meetings were the right thing to do for so long, I only wonder why it took us these many years to finally do it. Thanks to the local ministerial alliance for making this one materialize! I understand that the impetus came from the Catholic Monsignor, and someone told me later that the Pope had given some directive or edict—-whatever Popes issue—-encouraging Catholic leaders to seek opportunities for fellowship among other Christian groups. If such be true, then God bless the Pope! We long for spring and the return of lizards! 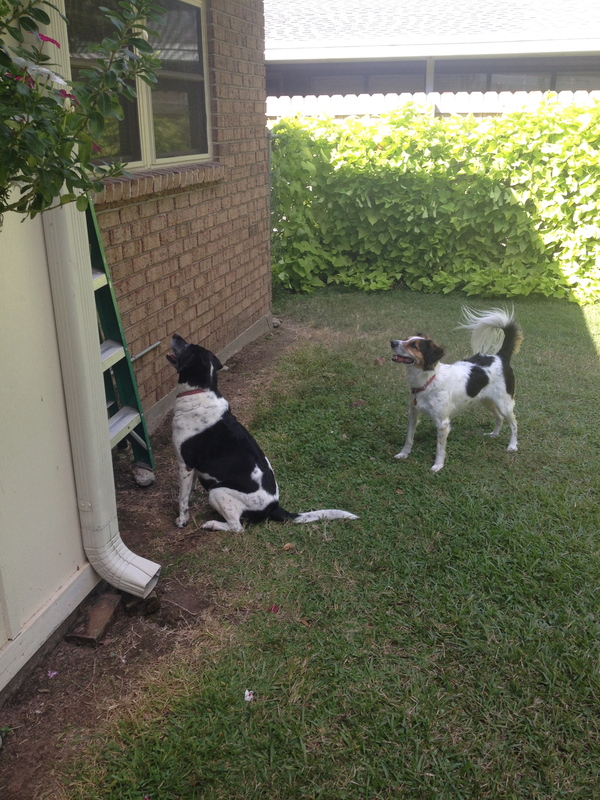 In warm weather, lizard hunting ranks among Sadie’s and Marley’s favorite past times. This picture from last summer, showing also the burgeoning potato vine on the fence that provided one of the lizards’ favorite hide-outs, recalls the familiar doggies’ pose in that warm-blooded season. They strive to flush the quarry out into the open for the sport of chase. And the activity truly is sport, because the lizards ordinarily do the work of preserving their hides from the much larger dogs’ spirited pursuit. Occasionally a lizard slips up and falls to the dogs’ murderous paws and jaws, but just often enough to keep dogs’ interest in the possibility. Since lizards are cold-blooded creatures, the sport is seasonal. We miss this entertainment in the dead of winter, as the dogs miss the exercise of patrolling the fence-lines and outer walls for lizard prey. Thus, as we humans are anxious for the passing of winter and the blossom of spring, so must be the dogs, whose outlook for diversion and exercise is diminished by the rudeness of the cold the same as ours. Winter, hie thee hence away, and return the lizards! Popular mythology—-not the bible—-popularized the notion that the forbidden fruit in the Garden of Eden was an apple. Yep, ol’ Adam took a bite of the apple and got kicked out of Eden as a result. But who decided the Tree of Life in Genesis bore apples? 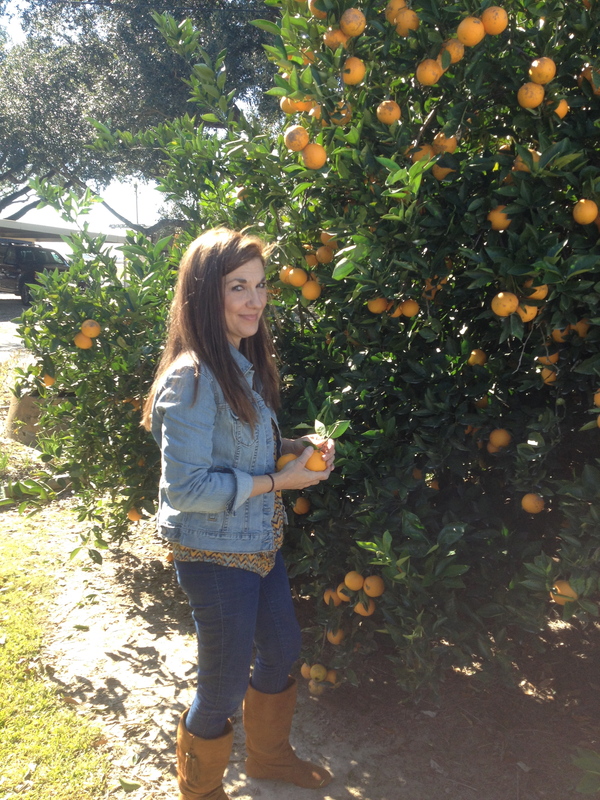 When I regard this picture of my girl Sarah picking oranges in our friend’s orchard last Thanksgiving holidays, I find it entirely plausible that the forbidden fruit was an orange! Look how the laden tree is sensuous, enticing with its verdant foliage, punctuated with the orbed brilliance of the fruit! Is that orange tree less fit as a Tree of Life than an apple tree? Hardly! And if the fruit isn’t enticing enough, how about the pose, that canaille, flirtatious expression that Madame Sarah casts my way as I hold the camera? Could Eve have regarded Adam with any less cunning as she bade Adam to taste the forbidden fruit? Surely not! I confess that I did eat of the fruit of that tree . . . or more precisely drank of it, because we juiced the oranges. But we didn’t get kicked out of the orchard—-in fact, my friend the farmer invited us back during the Christmas holidays—-and the condition of man has fallen no lower than the deplorable depths to which it had already sunk before we went there. We are blessed in that we surely did enjoy the orange juice and no harm came to us or the world around us in the aftermath. In a theological sense, I suppose Adam’s and Eve’s treachery was sufficient to doom posterity without additional exertion on my part, so may we eat and drink merrily the fruit of the orange as we reflect gratefully on grace that sustains us in the brokenness of disease, catastrophe, and strife. Ah, grace? Yeah, that’s what that orange juice tasted like. Oranges of grace! For a long season of my life, during younger years, the winter’s chill never arrived soon enough, waxed cold enough, nor lasted long enough. 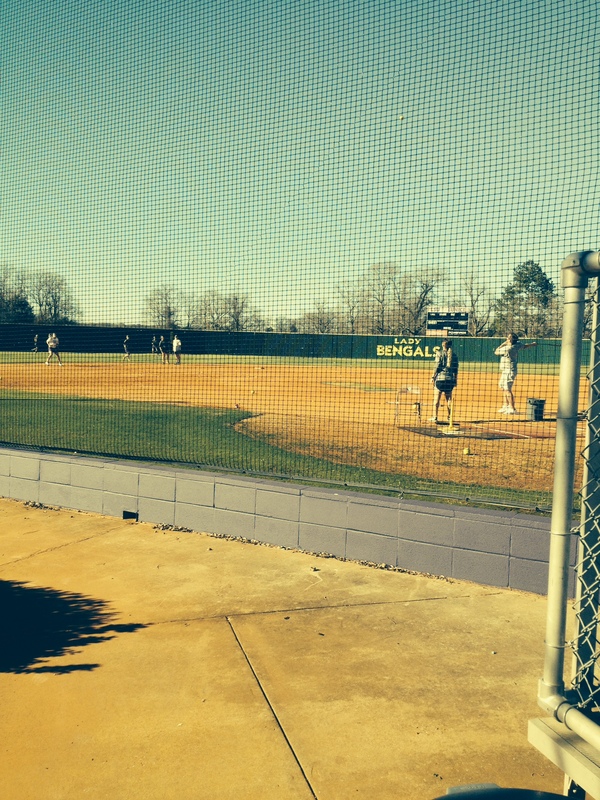 This past week we endured one of those gray, sullen, steely-cold Gulf Coast dead-of-winter spells. I’m watching the thermometer this morning rise out of the thirties for the first time in two-and-a-half days of bone-numbing cold, blustery winds, dreary episodes of rain and grimy mist, and depressing winter gloom. I’ve had enough. How people up north deal with the dark and cold so much more severe than this, I can only wonder. But alas. We’re in the climatological dead of winter right now, so the flickering promise of spring looms on the horizon of hope. Just a few more chilly weeks, and we’ll all feel better about longer, happier, warmer days. Hoorray! 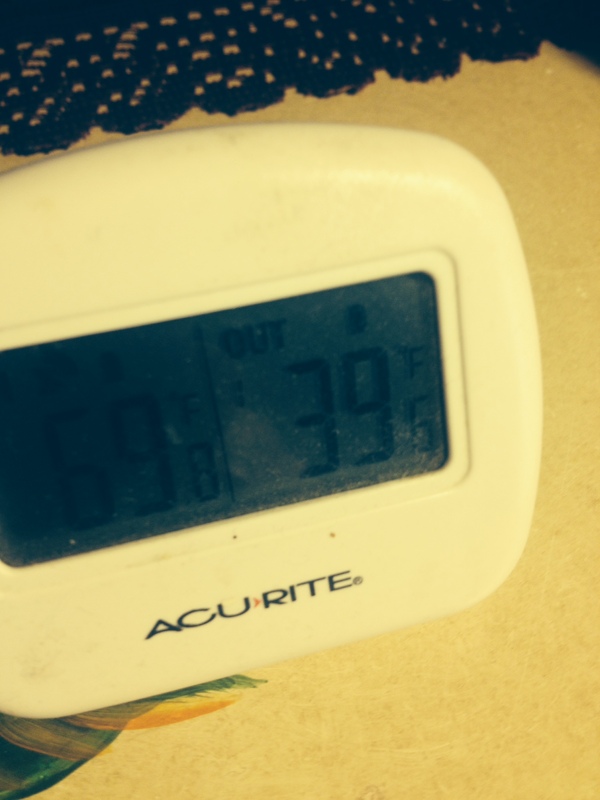 Almost 40 for first time in three days! When I look at any sandwich joint’s or restaurant’s sandwich menu to order, I can never get past the oyster po’boy. I’ve sampled all species of Subway sandwiches, Phillie Cheesesteak in Philadelphia, grinders in Rhode Island, and many other species of specialty sandwiches across the nation, including other flavors of New Orleans po’boys. 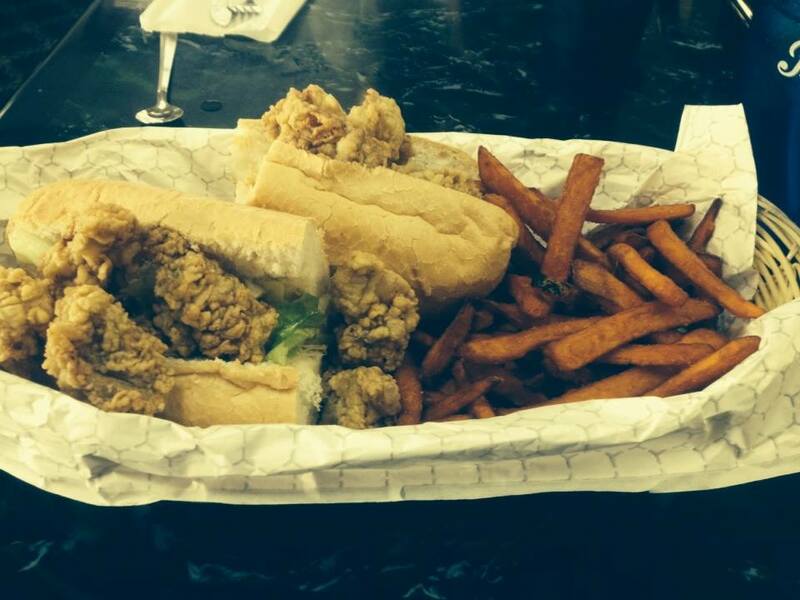 But to my taste, nothing compares to a well-prepared fried oyster po’boy. Since fried oysters are my all-time favorite food, a po’boy is really hard to pass. Criteria 1: The oysters: size and quantity. Plump oysters are preferable to small oysters. The number of oysters should be more than the bun can contain–In other words, if excess oysters don’t fall out of the sandwich when you try to fold the halves of bun together, the sandwich is deficient in quantity. Criteria 2: Crispy/crunchy. Well-fried oysters are never served mushy, limp, or at room-temperature. They’re hot out of the grease and very crisp. One hears “crunch” biting into the golden nuggets. Criteria 3: The bun. Traditional New Orleans po’boys are served on traditional New Orleans French bread. The perfect crust is hard, flaking and crumbling in your lap if you try to bite off too much at once. A true po-boy is not a loaf that one slices as a slice of bread, either, but rather a crusty loaf that one must saw with a serrated blade to cut. No butter knife can do the cutting if the bread is authentic. The bun must also be served warm to fetch the best rating. Criteria 4: The dressing. Classic po’boys come dressed with lettuce, tomatoes, pickles, and mayonnaise. Ketchup or tartar sauce are acceptable dressings or substitute for mayo. The lettuce/tomato/pickle on the best po’boys is laid the bun as a thick bedding for the oysters. Even without the oysters, the dressing should be sufficient to give the folded bun substance and filling. Padding with cheap lettuce to the neglect of tomatoes and pickles, though, is an indication that the restaurant is cutting cost corners, which will lower the rating for this criterion. Criteria 5: Taste. They’re salty but never fishy, spicy and tangy but never overwhelming. The most important feature is that out of all the ingredients–bun, lettuce, tomato, pickle, mayo–the most interesting taste feature that stands out is the flavor of the oysters. One almost has to experience eating oysters raw to have the right baseline for judging the taste of the po’boy, because even fried (or cooked in any fashion), eating an oyster is a waste of time if the distinct oyster flavor is masked or over-ridden by some other combination of ingredients. I rate each criteria on a three-point scale: 3=exemplary, 2=acceptable, 1=needs improvement, 0=unacceptable. 15/15 rating points is A+, 14/15 is A, 13/15 is B+, 12/15 is B, 11/15 is B-, 10/15 is C+, 9/15 is C, 8/15 is D+, 7/15 is D, 6/15 is D-, and anything lower is F. A zero rating for any of the five criteria disqualifies the po’boy from a passing grade, even if the other criteria qualify for some rating points. The po’boy in the picture provides an example of the rating scale. For criteria 1, it got a 3–I couldn’t see the bun beneath the mountain of oysters piled thereupon! Criteria 2 fetched a 3, also. They were fried to perfection. Criteria 3 got a 2 rating. The bun was the right shape, but it lacked the hard crust, and it was served at room-temperature. Criteria 4 got a 1–I had trouble finding the tomatoes and pickles. Criteria 5 made up for criteria 4, though, because this po’boy tasted just right. Ratings total: 12. Grade: B. For an establishment outside of the Greater New Orleans area, that’s pretty good! Symbolic imagery in the New Years Eve bonfire south of Crowley last night at our Cajun Prairie celebration with family and friends struck me this morning as I searched for some appropriate New Year’s Day topic. Note the faint light in the western sky in the background as day fades in the waning hours of 2014. In the foreground, the consuming, crackling fire, energized by a compelling breeze, issues copious showers of embers that swirl through the darkening sky like a bristling swarm of fireflies. 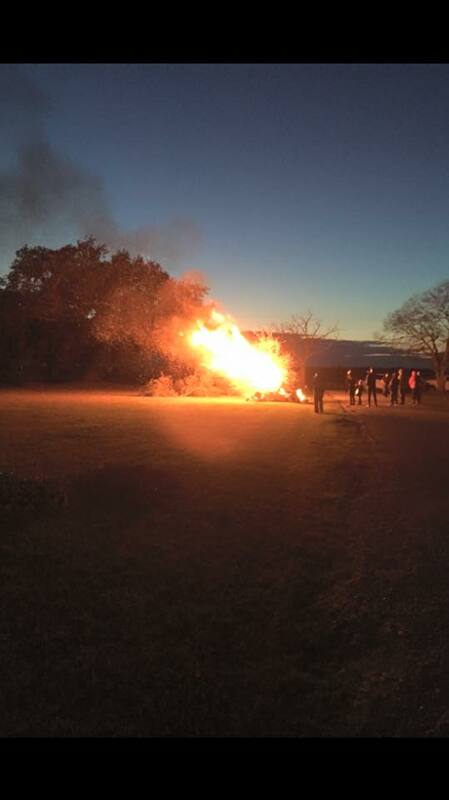 The New Year’s Eve fire of hope. We’ll see. Casting the anxiety of uncertainty aside, I claim the promise of showers of blessings as the new year unfolds: More to come in these pages of Inventio.